Band saw tires that are of poor quality are the main reason that band saws will not operate well. 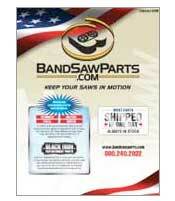 Band saws are saws that are primarily used for curve cutting and resawing by woodworkers. While very thin blades on a band saw are used for detailed and fine cutting, wider blades are used for straight cutting. The throat capacity, or the size of the saw from blade to frame, can range from 8 inches up to 36 inches. Typically the blades have two or three wheels. For woodworking purposes, the blade width can range from 1/8 inch up to 1 inch across. If you are a woodworker by trade, then a band saw, no doubt, is a tool you use almost every day. For a great deal of straight cutting or resawing, you?ll want to choose at least a 14-inch band saw for your cutting needs. Band saws are versatile saws so they are highly prized for anyone who enjoys woodworking as a hobby or has made it their profession. In professional shops, woodworkers particularly like 17? size band saws as they are usually the most economical, although the saws also come in 19?, 21? and 24? sizes. The 17-inch band saws are particularly good for resawing and curve cutting. Therefore, choosing the right band saw tires is key to achieving good results when you?re woodworking. It doesn?t matter then if your band saw is aligned properly. If your tires go bad, your machine will not cut wood with optimum efficiency. The Internet offers various brands of band saw tires, including Delta band saw tires and Harbor Freight tires. For example, you can replace an old band saw tire with model number 426020940003 from Delta. This model tire fits all Delta 14-inch band saws. The manufacturer suggests that you use weatherstrip adhesive by 3M to affix the tire to the wheel. The tire is 1 inch across and is 1/8 inch in thickness. A band saw tire is a vital piece of equipment on a band saw as it keeps the blade from making contact with the wheel and causing damage. The aforementioned brands offer band saw tires made of rubber or urethane. For the money, urethane is probably a better choice as it doesn't require glue to keep the tire in place and generally lasts longer than a rubber tire. Urethane Tires will normally require submersion in hot soapy water to realx the tire and allow for easier mounting. Urethane tires will need to be sized as a direct replacement for an OEM wheel as they do not allow any stretch. If your machine takes a rubber tire larger than a 10" diameter you can select a rubber tire sized a half an inche smaller or larger than the wheel for a good and reliable fit. Most tires, like the products mentioned, cost from around $39.00 on average at local retail outlets and on the Internet. Rubber Tire 6" x 3/4"
6" diameter by 3/4" wide tire requires 1 adhesive per pair. All tires have a uniform thickness over their width and will conform to the underlying surface of the wheel. Rubber Tire 8" x 3/4"
8" diameter 3/4" wide tire requires 1 adhesive per pair. All tires have a uniform thickness over their width and will conform to the underlying surface of the wheel. 3/4" wide by 1/8" thick. Band Saw Tires are made from the highest quality material to exacting standards. Thats why they deliver such outstanding performance and wear consistently for so long. Rubber tires require adhesive for installation. We recomend the 3M Industrial adhesive for sizes 20" and under, and epoxy for 20" and up All tires are sold as single tires and prices are per tire. Rubber Tire 12" x 1 1/16"
1 1/16" wide by 5/32" thick. Band Saw Tires are made from the highest quality material to exacting standards. Thats why they deliver such outstanding performance and wear consistently for so long. Rubber tires require adhesive for installation. We recomend the 3M Industrial adhesive for sizes 20" and under, and epoxy for 20" and up All tires are sold as single tires and prices are per tire. 1 1/16 wide by 5/32" thick. Band Saw Tires are made from the highest quality material to exacting standards. Thats why they deliver such outstanding performance and wear consistently for so long. Rubber tires require adhesive for installation. We recomend the 3M Industrial adhesive for sizes 20" and under, and epoxy for 20" and up All tires are sold as single tires and prices are per tire. 1 5/16" wide by 5/32" thick. Band Saw Tires are made from the highest quality material to exacting standards. Thats why they deliver such outstanding performance and wear consistently for so long. Rubber tires require adhesive for installation. We recomend the 3M Industrial adhesive for sizes 20" and under, and epoxy for 20" and up All tires are sold as single tires and prices are per tire. 1 1/2" wide by 3/16" thick. Carter Band Saw Tires are made from the highest quality material to exacting standards. Thats why they deliver such outstanding performance and wear consistently for so long. Rubber tires require adhesive for installation. We recomend the 3M Industrial adhesive for sizes 20" and under, and epoxy for 20" and up. All tires are sold as single tires and prices are per tire. 1 5/8" wide by 3/16" thick. Band Saw Tires are made from the highest quality material to exacting standards. Thats why they deliver such outstanding performance and wear consistently for so long. Rubber tires require adhesive for installation. We recomend the 3M Industrial adhesive for sizes 20" and under, and epoxy for 20" and up All tires are sold as single tires and prices are per tire. 1 3/8" wide by 3/16" thick for Delta 20" saws. Band Saw Tires are made from the highest quality material to exacting standards. Thats why they deliver such outstanding performance and wear consistently for so long. Rubber tires require adhesive for installation. We recomend the 3M Industrial adhesive for sizes 20" and under, and epoxy for 20" and up. All tires are sold as single tires and prices are per tire. 1 3/4" wide by 3/16" thick. Band Saw Tires are made from the highest quality material to exacting standards. Thats why they deliver such outstanding performance and wear consistently for so long. Rubber tires require adhesive for installation. We recomend the 3M Industrial adhesive for sizes 20" and under, and epoxy for 20" and up. All tires are sold as single tires and prices are per tire. 2" wide by 3/16" thick. Band Saw Tires are made from the highest quality material to exacting standards. Thats why they deliver such outstanding performance and wear consistently for so long. Rubber tires require adhesive for installation. We recomend the 3M Industrial adhesive for sizes 20" and under, and epoxy for 20" and up. All tires are sold as single tires and prices are per tire. 2 1/8" wide by 3/16" thick. Band Saw Tires are made from the highest quality material to exacting standards. Thats why they deliver such outstanding performance and wear consistently for so long. Rubber tires require adhesive for installation. We recomend the 3M Industrial adhesive for sizes 20" and under, and epoxy for 20" and up. All tires are sold as single tires and prices are per tire. 2 1/4" wide by 3/16" thick. Band Saw Tires are made from the highest quality material to exacting standards. Thats why they deliver such outstanding performance and wear consistently for so long. Rubber tires require adhesive for installation. We recomend the 3M Industrial adhesive for sizes 20" and under, and epoxy for 20" and up. All tires are sold as single tires and prices are per tire. 3 1/8" wide by 7/32 thick. Band Saw Tires are made from the highest quality material to exacting standards. Thats why they deliver such outstanding performance and wear consistently for so long. Rubber tires require adhesive for installation. We recomend the 3M Industrial adhesive for sizes 20" and under, and epoxy for 20" and up. All tires are sold as single tires and prices are per tire.